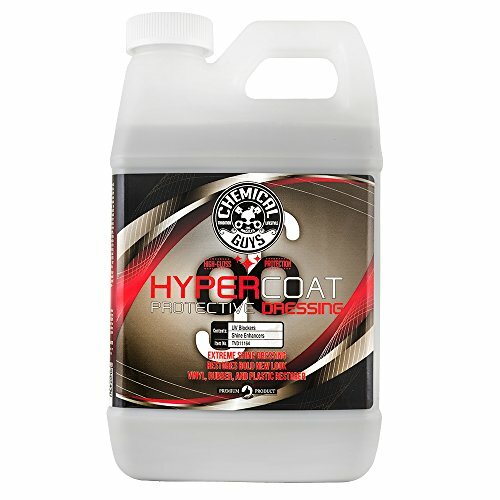 G6 hyper coat restores and protects vinyl, rubber, and plastic car parts with a brand new look and brilliant shine. Chemical Guys blended synthetic polymers with proprietary G6 technology to create a liquid trim sealant for use inside or outside any vehicle. The water-based hyper coat formula nourishes dried-out and sun-faded parts to rejuvenate a deep-black new appearance with a bright wet shine. G6 trim sealant technology repels the harsh UV light and extreme heat that damages, cracks, and fades plastic and rubber parts. Treat exterior bumpers, door mirrors, window moldings, grilles, vents, and tires to get rid of any sun-faded chalky white look. Restore a brand-new appearance to interior door panels, center consoles, upholstery, dashboards, and engine bay components. G6 hyper coat finishes dry to the touch, and will not attract dirt or dust. The refined formula Penetrates deep to nourish the material, and leaves no residue to smear or streak over nearby surfaces. Specialty sun blocking agents repel harmful UVA and UVB rays that fade and damage car parts prematurely, helping them look newer for longer. Choose G6 hyper coat to restore, enhance, and protect any interior or exterior vinyl, rubber, or plastic car parts with a bright wet shine.